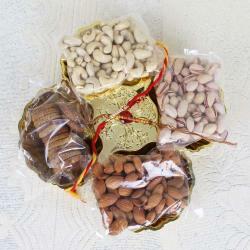 Product Consists: Set of Three Traditional Rakhi, Roli Chawal, Kaju Katli (Weight: 200 gms), Exclusive Assorted Dry Fruits (Weight: 600 gms) (Cashew, Almond, Dry Apricot, Dry Fig, Raisine and Pistachio) along with Designer Box. 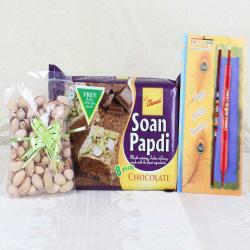 You will love this Raksha Bandhan combo gift pack of containing everything special that you need to surprise your darling brother on the auspicious occasion. The Rakhi will look amazing on wrist of your brother its golden hues and shades into its endearing design pattern of Roli Chawal play the perfect role of the same. This rakhi gives surprise to your brother with giving a lovely Auston Mint Dark Chocolate which is very delicious and perfect. Every sister wants the something symbolic to express her love, affection to her brother on Rakhi with this combo makes for the perfect solution without a doubt. While, tying this rakhi brother would be loved to have this Dry Fruits. 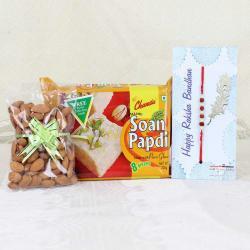 Chocolate with Rakhi will be the best and memorable gift for your brother in this raksha bandhan. 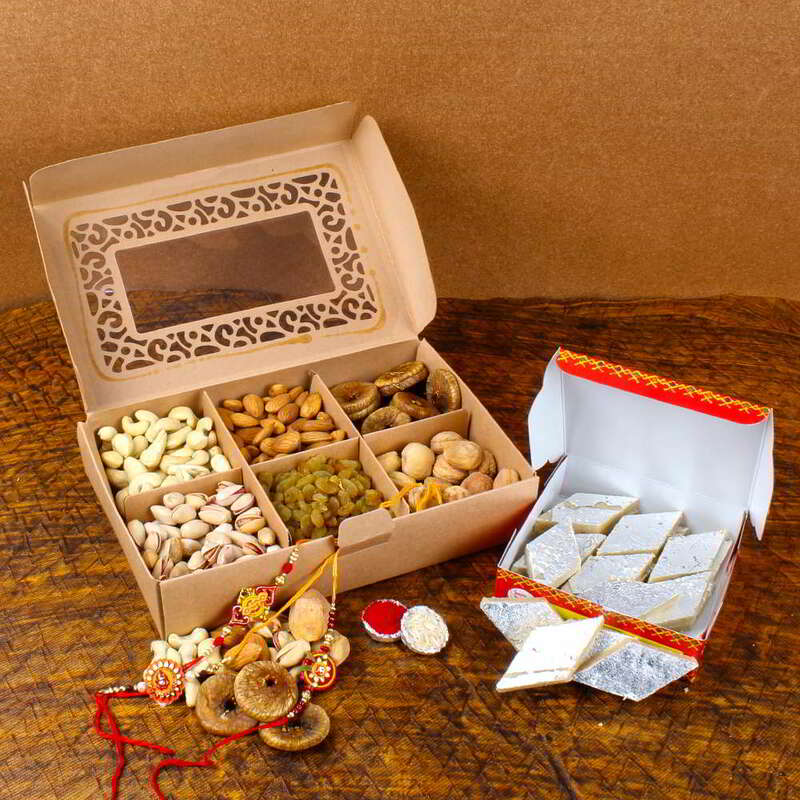 Beautiful Rakhi Combo includes : Set of Three Traditional Rakhi, Roli Chawal and Kaju Katli (Weight: 200 gms) with Exclusive Assorted Dry Fruits (Weight: 600 gms) (Cashew, Almond, Dry Apricot, Dry Fig, Raisins and Pistachio) in a Designer Box.